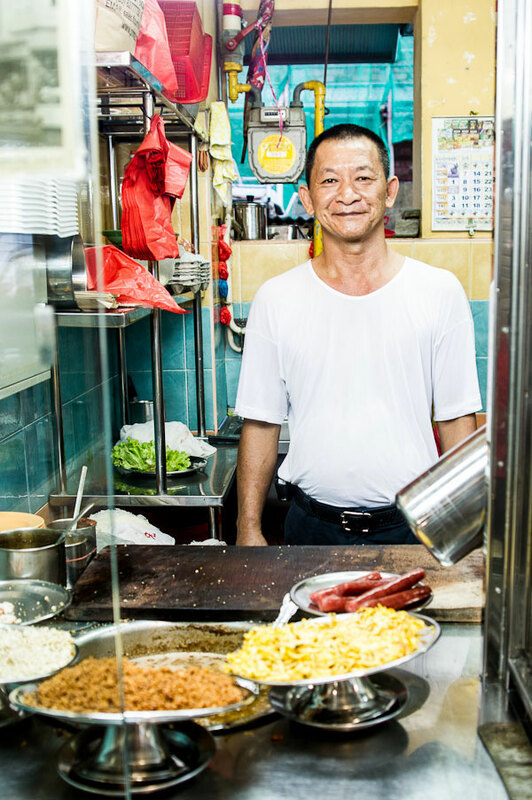 Despite its diminutive size, Singapore is second to none when it comes to eating street food. With four official languages (Chinese, Malay, English and Tamil), Singapore is a melding pot of people from around the world, and it shows in their cuisine. While economic prosperity has brought fine dining from around the world to the city-state, the best food is eaten on plastic stools, where your sleeve fills in for a cloth napkin. 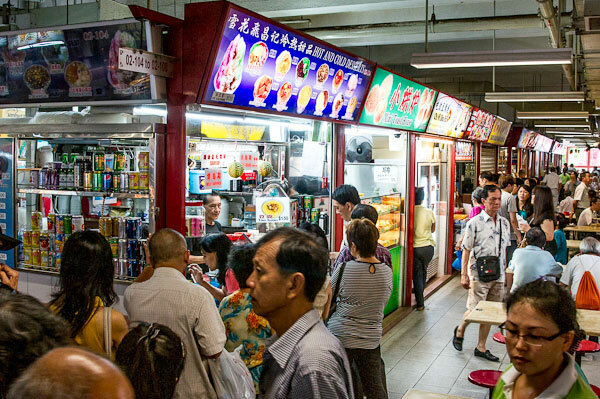 In Singapore, the government has consolidated all the street vendors into food centers setup all over the city. This not only makes the vendors easy to find, it also ensures certain hygienic standards are met. Singapore may very well be the only nation in Southeast Asia where you can let your inner glutton loose without worrying about the repercussions later. 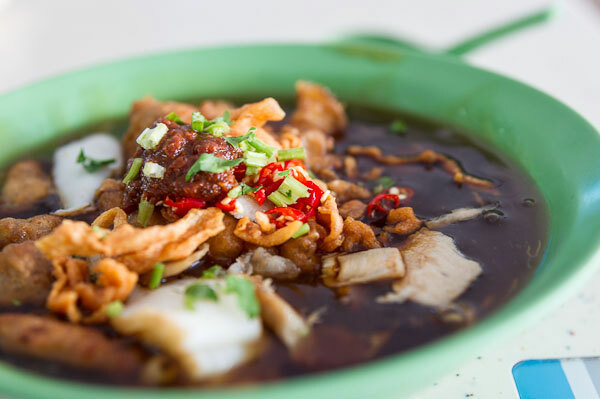 You’ve probably all heard about Singapore’s famed chicken rice and laksa, but here are five delightful street food specialties to try the next time you’re in Singapore. Yusheng literally means “raw fish”, but this Teochew-style dish is more than its simple name implies. 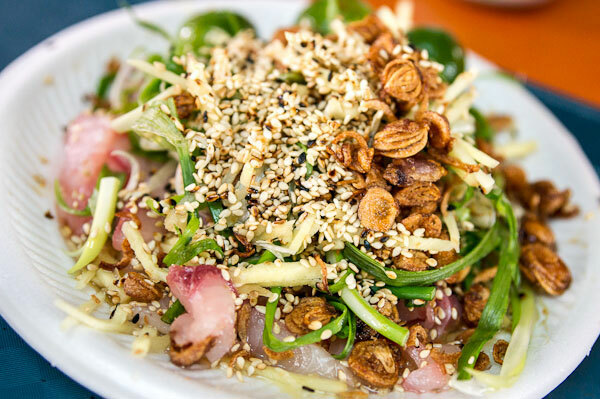 Often described as the Singaporean version of Carpaccio, thin slices of raw fish are topped with aromatics and dressed with oil and soy sauce. While eating raw fish on the street in any other country would almost certainly involve a trip to the hospital, in Singapore the plumbing, refrigeration, and a posted letter grade of the establishment’s cleanliness should put your mind at ease. At Zhen Zhen Porridge their specialty is rice porridge as the name implies, but I go there for the yusheng. 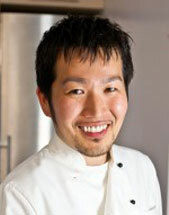 It’s served like a salad with a mound of scallions, ginger, fried shallots and sesame seeds covering the fish. A squeeze of “lime” (calamansi) makes the whole dish light and refreshing. Chwee Kueh literally means “water rice cakes” and is made by steaming little tins filled with water and rice flour. They’re smooth and creamy, and when topped with fried preserved radish and chili sauce, they make a tasty snack. When I got to Jian Bo Shui Kuei in Tiong Bahru Market somewhere between breakfast and lunch, there was still a line about ten deep waiting to pick up an order of their famous Chwee Kueh. According to the owner, the secret to their silky smooth rice cakes is that they mill their own rice flour. While it was undoubtedly inspired by Hokkien-style noodles, Lor Mee is a uniquely Singaporean dish. A bowl of toothsome egg noodles covered in a thick savory lor, it’s often topped with fish cake and pork. While Lor Mee 178 may be a relative new comer to the Lor Mee scene, they top their noodles with crispy shark meat fritters. Eaten with a spoonful of chili sauce and a splash of black vinegar it’s like a better version of fish and chips. 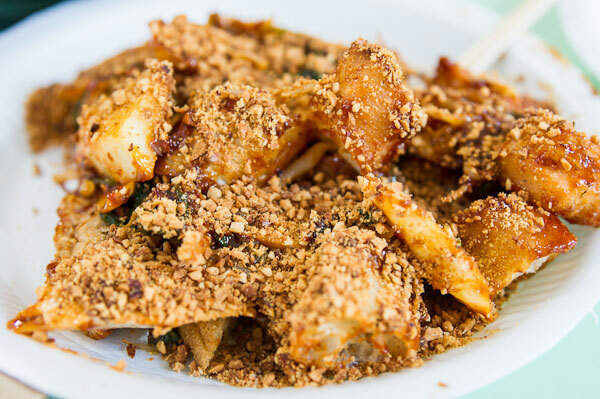 While Chicken Rice and Chili Crab are interchangeably touted as the national dish of Singapore, if there was one dish that represented the country in its make-up, it would be Rojak. 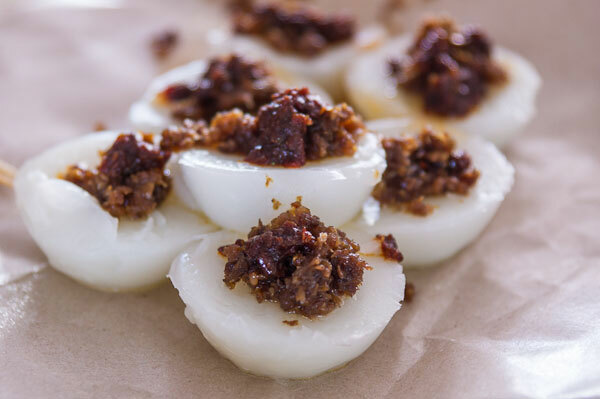 It’s a hodgepodge of ingredients; much like Singapore itself, and the name of the dish has became a colloquialism to describe people of mixed ethnicity. At Toa Payoh Rojak at the Old Airport Road Hawker Centre, the only dish they make is Rojak, and the old man behind the counter meticulously mixes each batch to order. With chunks of sweet pineapple, crispy jicama and crunchy fried dough tossed in a sweet shrimp sauce, it goes great alongside a more savory dish. 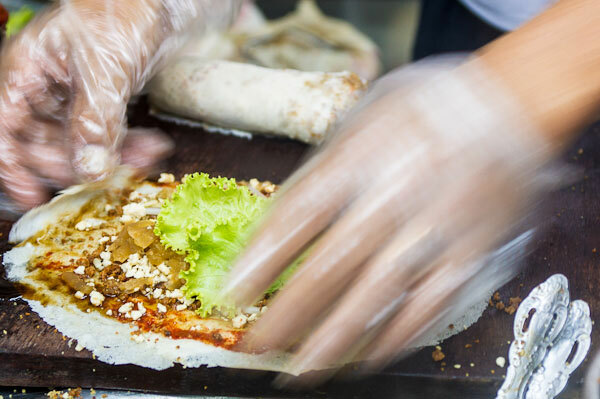 Originally from the Fujian province in southern China, Popiah was introduced to Singapore by Teochew immigrants. It’s a thin crepe that’s filled with meat, seafood and vegetables before being rolled up like a spring roll. At Jia Dong Shu Shi in the Dunman Food Centre, the shop owner stuffs his popiah with shrimp, minced pork, lap cheong, egg, jicama, braised vegetables and fried garlic, binding the filling together with some braising liquid and a thick sweet sauce. Lastly if you find yourself in a food center and are unsure about what to get, do as the locals do and get in the longest line. I once asked someone waiting in a line that wrapped halfway around the hawker center what he was waiting for, he responded “I don’t know, but it must be good!” In a country with a love of food that borders on obsession, he probably made a pretty good call.